What started out as a hobby turned into something for Stone Fruit Coffee Company’s customers and employees to enjoy. 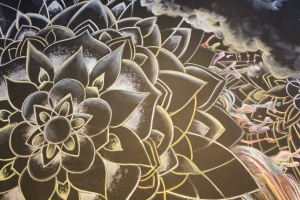 The chalk murals people see when they venture inside the coffee shop are the works of Christian Powers. Powers was a barista at Starbucks when he first started working with art, and he went to high school with the regional manager of Stone Fruit. Powers said the regional manager contacted him one day, saying she had a chalkboard that needed some art on it. He was just expecting a little bulletin board, but ended up with a massive wall. “I’ve never worked with chalk in such a way that it would be like, 20 feet high,” Powers said. 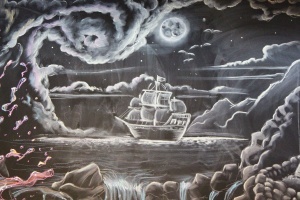 He ended up not only as an employee at Stone Fruit, but also an artist for them as well. He said since he has gotten better at it, he can finish murals quicker. Powers said some of the chalk murals he’s done are pre-drawn. He thinks of ideas, but a lot of the time, it just spews. He said he will do a little portion of the wall, and then he’ll sit down and sketch something else up, and then he’ll stand up and start again whenever he has an idea. Powers said he’s doing this because he gets a lot of freedom to express his artistic abilities. He said Stone Fruit owner Josh Langenheim is cool about it. Syd Clayton, a manager at Stone Fruit, said Powers chalk art for Stone Fruit has given him opportunities to go around in the community to do art for different places. Emma Linnen, a barista at Stone Fruit, said Powers is the most artistically talented person she’s ever known. She said sometimes she will sit and watch Powers draw after hours. Linnen said from the very beginning, Powers might have something in his book where he draws and sketches everything out initially, and when he puts it up on the wall, he does it all free hand. Clayton said Powers’ art is a huge aspect of Stone Fruit’s image. He said every location has the chalk art and the woodwork, so the two go hand in hand.